So we come to the final GP of the 2004 season. Unfortunately it has been a season of increasing resentment by the fans world wide, who have become totally disenchanted with “strategies” and “play station” racing from the pits, while the drivers play dodgem car racing. This is not F1. There is much going on (not the least of which is the proposed A1 Grand Prix series - see this column last week) and I sincerely hope that next year will be better than this season. The final round in Brazil will not see any real changes in the results for the year, unless Renault come home 1-2 and BAR score no points, and this is about as likely as Ferrari offering Alex Yoong a seat alongside Michael Schumacher for next year! The Brazilian GP has been famous over the years for the unruly crowd and circuit signs that fall down. With the time difference between that side of the world and us, I think the event will begin at midnight on Sunday 24. Being the world’s great optimist, I will be sitting on my perch in front of the big screen in Shenanigans, so come and keep me company. We’ll have a couple of ales and rubbish the commentary, unless it is a nail-biting race, and that’s probably about as likely as the aforementioned Yoong-Schumacher scenario. Last week, I asked what 7.5 litre V8 engined production sedan car connected the torque convertor to the gearbox via a chain? Clue - think of the late 60’s. It was the Oldsmobile Toronado, the huge FWD monster built between 1965-1970. The torque convertor was on the back of the engine, but the three speed Hydramatic was under the left hand cylinder bank, joined by a Morse chain. So to this week. Remember the Citroen Light 15’s? They had the gear lever protruding from the dashboard, with a kind of hairy thing either side. Well, they weren’t the first to come out with the idea of having the gear lever in the dash. Which car was the first? This is an event not to be missed by those who revel in the off-road events, or would even just like to be part of the off-road movement. It is free! So that’s a good start. There are no entry fees and the organizers are expecting about 500 Off-road trucks from all over Thailand, and another 20-40 vehicles from Malaysia. The event is something like a jamboree or carnival with some off-road activities, off-road car shows, car accessory sales, food stalls and information booths. There will be trips to poor hill-tribe villages in the mountains near Chiang Mai and Chiang Rai areas on the off-road tracks, to make donations. The villages that will be visited have requested old clothing, blankets, sporting equipment (e.g. footballs, volleyballs, badminton, takraw balls). So if you want to join this trip, please bring anything you wish to donate with you when you come to Chiang Mai. Each group meets in Chiang Mai, camping at Huay Teung Tao, Muang District, Chiang Mai. This event looks like a great fun weekend, and the North is famous for its hospitality. 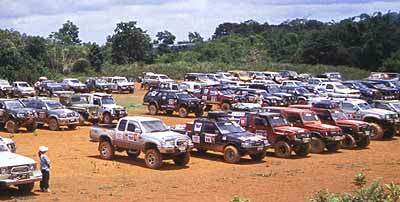 If you own a 4WD/off-roader, I reckon you should start making enquiries straight away. 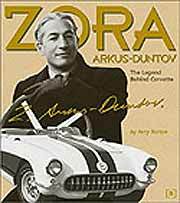 Received a press release the other day, which stated that in September 1955, Zora Arkus-Duntov raced a disguised 1956 model Corvette with a V8 engine at the Pike’s Peak Hill climb, setting the stock car record of with a time of 17 hours 24 minutes and 5 seconds. I didn’t realize that the old Vette’s were that slow! Considering that in the first ever Pikes Peak Hill Climb in 1916, professional racer Floyd Clymer on his Excelsior motorcycle posted an overall record time of 21 minutes 58 seconds, poor old Zora must have stopped for lunch, dinner and a massage and cleared the final km with his bare hands to take 17 hours in 1955. Or perhaps they meant to say it took 17 minutes, 24.5 seconds! C’mon guys, it’s a 19 km course which is regularly covered in around 10 minutes these days. If you want us to regurgitate your press releases, try and get the facts right! OK? The ‘king’ of the Peak for me is expatriate EnZedder Rod Millen who drives such things as a Toyota Tacoma truck with AWD and 800 neddies. 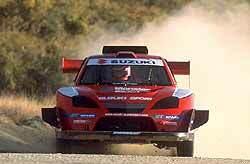 Monster Tajima is another of the Pikes Peak heroes in his specially built Suzuki. The electric answer to the fuel situation? It is interesting to look at the various power sources that have been used to claim the World Land Speed records. Try these for size - steam, electric, internal combustion, jet, rocket and turbine. With the power debate that is current in the world, with fuel cells, solar power and the like, as opposed to the internal combustion engine’s use of gasoline (including diesel), the enduring source of power in the motor industry is still electricity. What has to be remembered is that both hydrogen fuel and solar power ends up being converted to electricity to actually propel the vehicles forward. Let’s look at when we first started with electric vehicles, with one of the most famous from the beginning of time, motoring-wise - La Jamais Contente. The vehicle was driven in 1899 by the Red Devil himself, Belgian Camille Jenatzy (1868-1913), to a blistering 100 kph, the first vehicle in the world to achieve this benchmark. So here we are, 105 years later and hybrids combining electric and internal combustion engines are looking like the way of the future, with the Japanese very much in the forefront. Honda, Suzuki, Toyota, Lexus, Nissan, and Subaru all having hybrids for sale, or being developed for production. In the US, all of the Big Three are working independently on fuel cells, driving, yes, you guessed it - electric motors. How do fuel cells work? A fuel cell combines hydrogen from some other fuel source with oxygen from the air to produce electrical energy, with water as the only by-product. The cell consists of four key elements. First is the proton exchange membrane, which goes by the technical name of perfluorosulphonic acid polymer. This acts as an electrolyte. Second is the electrocatalyst layer, using a platinum alloy. Third is a gas diffusion layer made of carbon cloth or paper, and fourth is a bipolar plate, which acts as a separator. As hydrogen and oxygen move through the fuel cell’s layers, they recombine to form water, or more accurately, water vapour, and in doing so, a small electrical charge is produced as well. Fuel cells are then stacked to produce enough electricity to power an automobile. The amount needed is around 70 kW. The future is to use electrical power even more than just now. Other features in the vehicles of tomorrow can be adapted and handled better by electricity, and this includes brakes and steering. DaimlerChrysler, for example, have electric operated accelerator and brake pedals in a current concept vehicle, and the new BMW 5 Series has its electric steering. You don’t need to be a bright spark to see where we are heading! 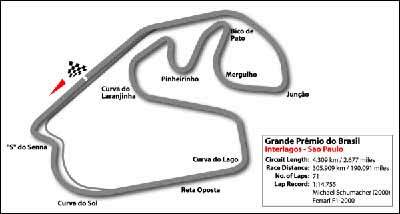 The name Interlagos comes from the Portuguese for ‘between the lakes’ because the circuit was built in a natural bowl which had two small lakes in it. Their position dictated the layout of the 7.2 km track which was built in 1954 close to Sao Paolo (Ayrton Senna’s home city). Interlagos hosted the Brazilian GP from the first non-championship race in 1972 through to 1980, with the exception of 1978 when it was held in Rio de Janeiro. After 1980, it went to Rio again, until 1989 when it returned to Interlagos, where it has remained. This coincided with a new layout which retained the old section on both sides of the start/finish line. The infield kept the character of the original, but lap distance was shortened from 7.2 km to 4.3 km. One of the new corners was named after Ayrton Senna. The official name of the circuit is the Autodromo Carlos Pace in memory of Pace, the Brazilian who scored the only Grand Prix win of his brief career at Interlagos in 1975. What did we learn from the last GP in Japan? However, national televised pride put aside, the Japanese GP was a boring event, I’m afraid. Michael Schumacher just ran away and hid. Quickest in every session leading up to the GP and quite untouchable. The man is a magician! Of the others, Barichello again demonstrated that he is ideal number 2, or 3, or 4, or 9 or 29 material, and had a problem trying to pass Coulthard, neatly bending his left front suspension, at the same time as bending Coulthard’s right front suspension. And these, gentle reader, are two of the best 20 drivers in the world? Mind you, we didn’t get to see the actual incident on TV, because (a) neither of the drivers were Japanese, and (b) neither of the cars was a Honda or a Toyota. Jenson Button drove well (and Sato did too), and I still remain amazed that Button is busting his boilers to leave BAR, when they have got him on the podium something like 10 times this season. Villeneuve in the Renault again failed to impress, and Montoya should be sent home to Colombia for yet another lack-lustre performance in the BMW Williams. As for the rest, I have no idea, as Mr. Japanese TV director wouldn’t show us what was going on with any of the other non-Japanese drivers in non-Japanese cars!